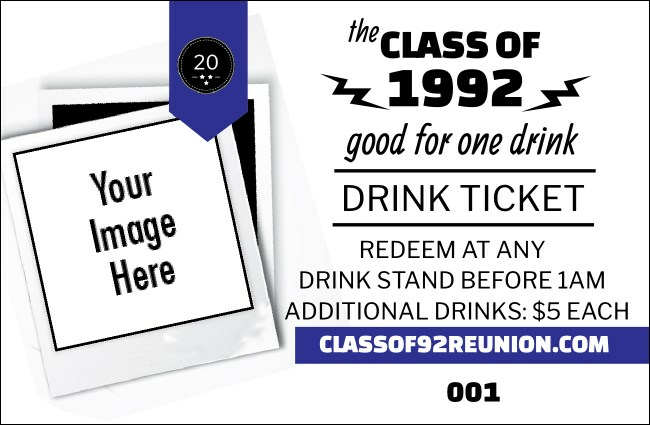 Let your guests join all their old buddies at the bar when you give them Class Reunion Mascot Blue Drink Tickets at your next school reunion. Keep it classy with dark blue and white ticket templates that feature space for you to upload your own unique image, like a school mascot or even your sponsor’s logo. Don’t be blue! TicketPrinting.com has the perfect ticket for you.